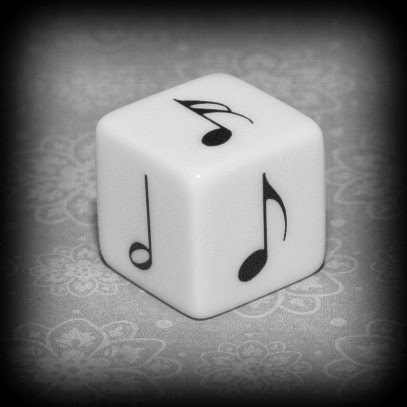 At group lesson last week we played a fun game with my beginning to intermediate students with the musical notes dice with sixteenth notes on it. This die has six different notes ranging from sixteenth note to whole note. Each note has a different value. I paired the kids up by ability level and they would each roll a dice. We had colored chips in the middle (although pennies, jewels, rocks, beads would work.) Whoever got the higher value of dice would get one of the chips. If they got the same value then they would roll until someone won and that person would get however many chips it took to roll the winning dice. They always had to say what kind of note and how many beats (ex: "quarter note, one beat." "sixteenth note, one-fourth beat." What I really liked about this was that even the beginning 4 year old knew the note names values of the dice after only about 2 minutes. This was a fun way to really drill this concept in a short amount of time. You can buy these fun dice HERE at The Practice Shoppe!